MYJAR are an award-winning UK lender, offering instalment loans of up to £3600 for new and existing customers. Established in 2009, they have issued over 2 million loans to UK borrowers and earned an impressive average Trustpilot customer satisfaction score of 9.3/10. What is the duration of a MYJAR loan? The duration of a MYJAR loan is between three and twelve months. The term that you are offered will depend on your credit worthiness and lending history with MYJAR. Existing customers are encouraged to climb the MYJAR Ladder, which provides access to longer loan durations at lower rates, over time, with good account management. 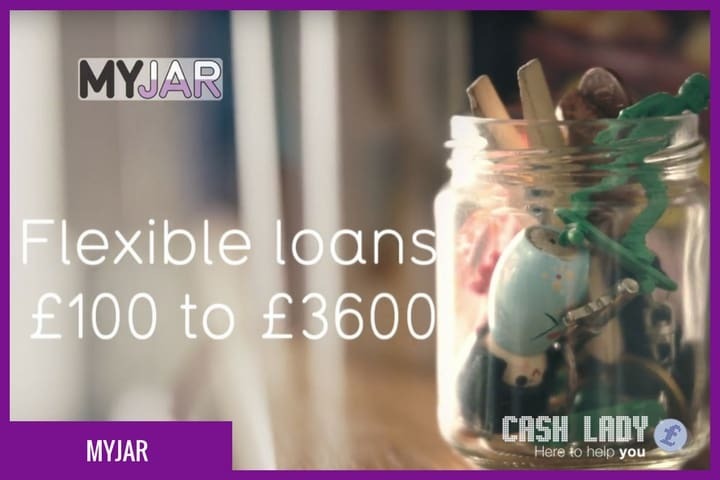 MYJAR offers loans up to a maximum of £3,600. The amount you can borrow, and for how long, depends their assessment of your loan affordability and credit rating. If you are an existing customer then you may be offered larger sums as you climb the MYJAR Ladder. What is MYJAR’s loan application process? You are required to complete the short online application form, where you’ll be asked about your personal and financial circumstances, including employment, bank details, regular salary and outgoings. After submitting your application, MYJAR will review your information and in some cases, may need to contact you for supporting documents to help confirm your address and verify your bank account details. They will then notify you by text and email about whether you have been accepted for a loan. If approved, you can request your preferred loan amount by logging into your online account, or by calling the MYJAR customer service team. How quickly will I receive my loan from MYJAR? MYJAR aim to provide your loan within 15 minutes of approving your loan. The amount that you are charged depends on the length of your MYJAR loan. Examples are provided below. Repaying early is always encouraged because it will reduce your loan duration and therefore the total interest charged on the amount that you borrow. There are no charges for taking out a MYJAR loan but you will be charged a late payment fee of £15 if you fail to make your repayments on time. Along with incurring a charge, late payment can also potentially damage your credit file. You should take a note of when your payments are going to be taken and ensure that the funds are available in your bank account. Can I repay my MYJAR loan early? You are encouraged to repay your MYJAR loan early. Additional repayments can be made through your online MYJAR account or by calling the customer service team. Will MYJAR run a credit check? MYJAR will run a credit check as part of the application process but you may still receive a loan even if you have less than perfect credit. Their main concern is that you can make your repayments comfortability and so they will carefully assess your current employment and loan affordability, as well as how you have managed your credit in the past. What help and support do MYJAR offer? MyJAR customer service is available seven days a week. You can contact them by telephone on 020 3006 2000, by sending an email to info@myjar.com, or through the contact form on their website. Where can you find online reviews of MYJAR? If you are considering taking out an instalment loan with MYJAR then online reviews provide helpful insight from genuine customers, who have previously borrowed with this lender. Online business review platform TrustPilot has over 3400 MYJAR reviews, with an average score of 9.3 out of 10, which places them in the ‘excellent’ category. What are MYJAR’s FCA registration details? MYJAR is authorised and regulated by the Financial Conduct Authority. Authorisation number 673214. You can check the register for yourself, ,here. Remove the hassle of researching different lenders and sending multiple loan applications, by applying just once, through Cashlady. We’ll provide you with a selection of quotes from suitable instalment loan providers, including MYJAR, so that you can make an informed decision about the best lender for you. Here at Cashlady we use our expert knowledge of the market, plus trusted suite of over 15 loan providers, to match you with the lender and financial products most suited to your needs. Simply complete our simple application form and we’ll do all the hard work for you, providing rates and prices, repayment terms and other important details that will help you to compare loan options.